Maple syrup is made by drilling a 3/8″ hole in a maple tree during the spring, and placing a small spout, or ‘tap’ into it. When temperatures fluctuate from above freezing to below freezing, the sap ‘runs’ up and down the tree with these changes. As it passes this tap, it drips out. 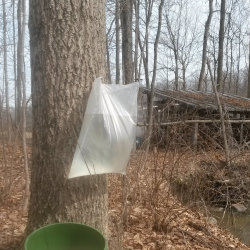 50 gallons of this sap is required to make 1 gallon of finished syrup. 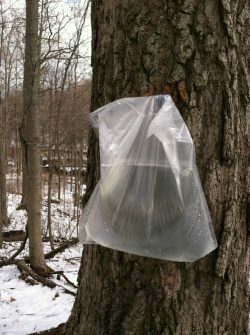 In Ohio, the temperatures required to make the sap run are sometime between January and March. After a few weeks the hole in the tree begins to heal closed, and the amount of sap diminishes. If the trees are tapped in January, and the season continues into March it may be beneficial to re-drill the holes. 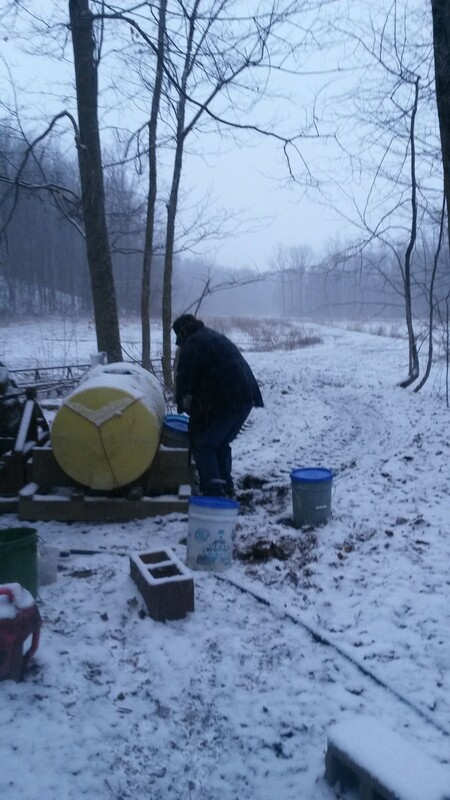 Buckets were the first item used to collect sap. The disadvantage is that rain and insects can easily get into the sap. The rain simply requires more boiling to get it to the correct consistency. The sap is strained many times during the process to remove Insects, leaves, etc. Tubing was the next method that was introduced. Small tubing runs from tree to tree, obviously running down hill. Eventually the small tubing is combined into larger tubes, and then into a collection tank. Daily the sap is pumped into a tank on the back of the tractor and transported to the camp where it is cooked. Small animals like squirrels occasionally chew on the tubing causing leaking. The most recent collection method is plastic bags. The first advantage is that they are lightweight. 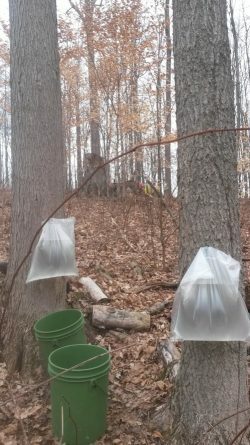 During the beginning of the season it is much easier to carry 30 plastic bags through the woods than 30 buckets. Also, rain nor insects can get into the sap. Sap is cooked in large shallow pans called evaporators. Obviously, the more surface area on the top of the sap the faster the water will boil out, which concentrates the sugar content of the sap making sugar. (Large shallow pans are more efficient than a smaller, deeper pan.) Our evaporator is about 3’x10′. The back of the pan in the picture above is the first place the sap begins to be cooked. The front portion is separate, and the hot sap from the back gradually flows into the left side of the front pan. The front pan is made like a maze with dividers, so the sap very slowly flows from back to front, gradually to the right. 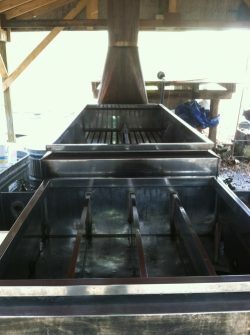 The right side of the front pan is where the finished syrup is produced. It is slowly taken from the pan. It takes a great deal of experience to know when to remove it. Finished syrup is 66% sugar. 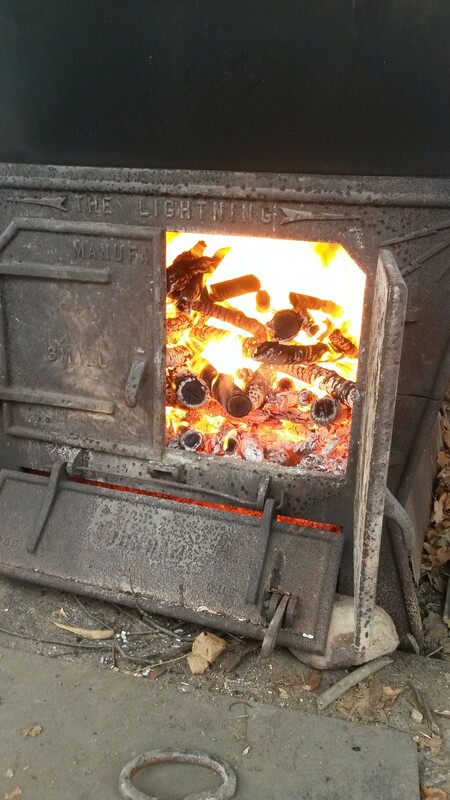 We use firewood to cook the sap. Collecting firewood is in itself a time consuming job. Controlling the fire takes a great deal of skill to cause the sap to boil as fast as possible, but not so hot that the syrup burns to the bottom of the pan. Some producers have access to natural gas. When Fred was a child he visited his grandparents in Crestline, Ohio where he watched them make syrup on their 20 acre woods. 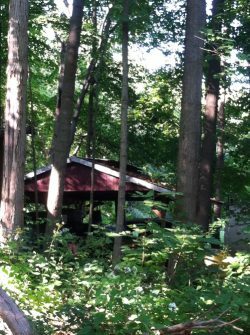 When we moved here in 1986, we began by tapping the trees in the yard by the house, then gradually expanded and made a camp with a pavilion and evaporator by the creek and the majority of the maple trees. At one point we tapped 500 trees and collect almost completely by tubing. At that time an Amish family lived in the small house by the straw maze, and they collected the sap with a team of horses. Eventually the family moved away and we had to take the tubing down in order to lumber 450 trees. We are continually cutting trees that compete with maple trees and will have the capacity to tap well over 500 in the future. How difficult is it to make syrup? 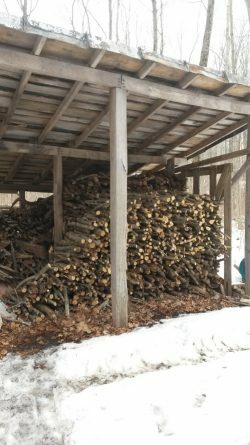 Long before the syrup season begins, we need to cut a great deal of fire wood so it can dry. Dry firewood burns significantly hotter and faster than wet. At the top of the hill you can barely see the tractor. That is where this sap must be carried to. The hill is muddy and slippery. Many of the days during the season are very cold and damp, The sap is collected on the yellow tank on the back of the tractor.